A — dare I say — radiant new facility for dancers, aerialists, pole aficionados and fitness buffs is beaming away in southwest Las Vegas. Shine Alternative Fitness, owned by “Zumanity” assistant company manager Russ Petroni and “Zumanity” solo artist Dima Shine, opened at the end of February and offers classes in things like ballet, contemporary dance, pole dance and antigravity yoga. The place has a Cirque-ish vibe, with artists working out and intermingling pleasantly, trading tricks and chatting. For more information about Shine, including location, directions, and schedule, check out the studio’s homepage here. 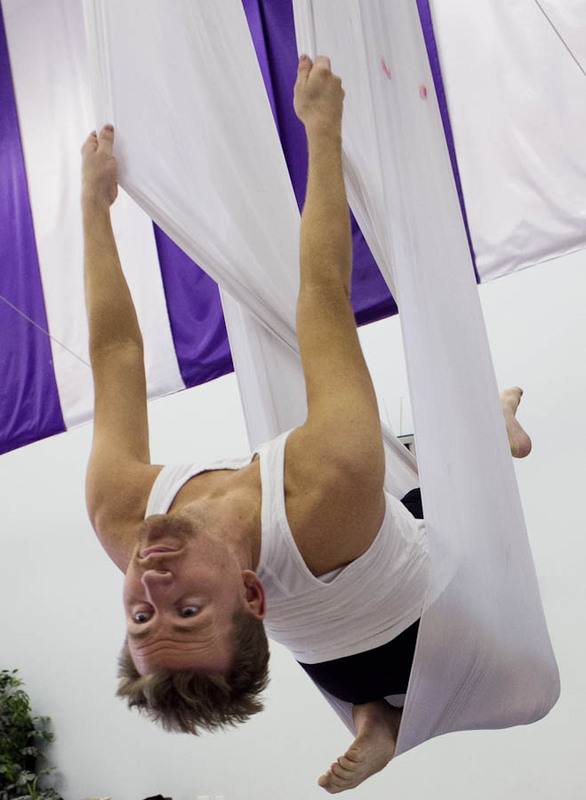 And keep checking back here for updates: a retelling of my first experience with antigravity yoga is coming soon! It’s not the apocalypse, but the pressure might have you feeling that way. 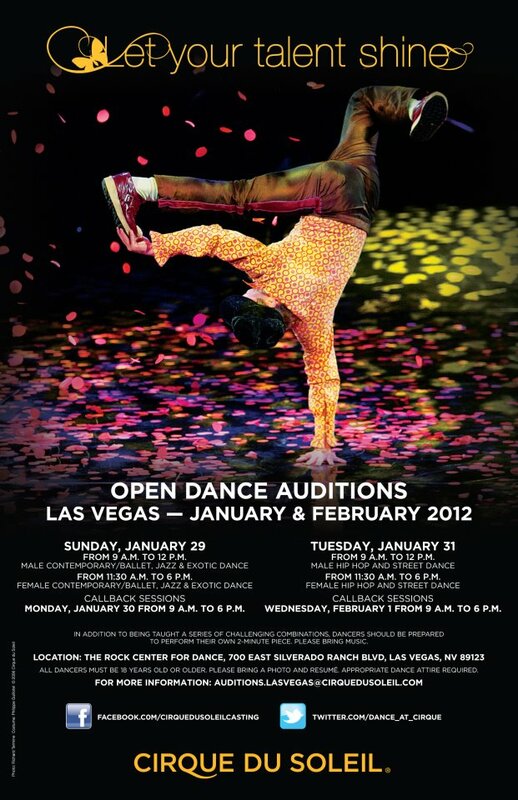 Cirque’s open call for ballet and contemporary dancers is tomorrow, Jan. 29 at the Rock Center for Dance. If this year is like previous ones, about 300 of your closest friends will be there as well, so pack a snack or two — you’re going to be there awhile — and come out. Guys are slated for 9 a.m. until noon and girls will join in at 11:30 a.m. until around 6. For details about and photos from last year’s audition, click here. And remember to bring your game face! So it’s been about six weeks, give or take, since I started my aerial endeavors and first shinnied up a strand of silk. Things are coming more naturally now; I’m not sore for days afterward and I can climb a decent distance above the ground before getting that fluttery, good-Lord-the-floor-is-far-away feeling. My brain seems to have caught up with all of this wrap, knot and lock business and I can go through a few basics before getting tired or confused, or both. I do, however, still spend a lot of time tired. And confused. But, ironically, I’m usually having an awesome time despite muscles that twitch involuntarily and “what did she just do? ?” moments. As it turns out, being airborne is fun and addictive. Our non-human primate pals might be onto something with all that brachiating they do. Skills, predictably, have gotten harder as we’ve gone along. An interesting thing about silks is that tricks tend to build on either basic wraps or one another. For example, a hip key is the beginning of a lot of moves, including those impressive drops and falls that circus smarty-pantses do. A figure-eight knot, which can be tied around one foot or two separate feet, allows the aerialist to do all kinds of fancy stuff, like splits and inverted poses.This modular quality of the discipline means that, once you’ve got some basics down, you start progressing more quickly. A close cousin to silks is the hammock, which, as the name suggests, is a looped piece of fabric instead of a purely vertical one. This is also an apparatus that has been added into our weekly repertoire. The fabric is the same, but maneuvering is a different animal and requires separate techniques from silks. Perplexed looks generally begins with the pullover, which is essentially a hips-over-face movement that gets a person into the thing (think of a gymnast pulling themselves up and over a horizontal bar.) From this point, you generally work from a seated or fully reclined position. The loop makes inversions easier and knots a little less prolific. Strength elements, however, remain the same: your forearms and fingers will be dying after an hour on either. Despite snazzy new moves, the basics of aerial work have remained the same. Practice is important, and this can be difficult when you don’t have a 40-foot-long strand of fabric handy. Things don’t always go as planned … as the photo above demonstrates. Patience is a good thing to keep on hand. Enthusiasm is advantageous, and nothing quite beats that moment of stillness that descends right before a stunt. 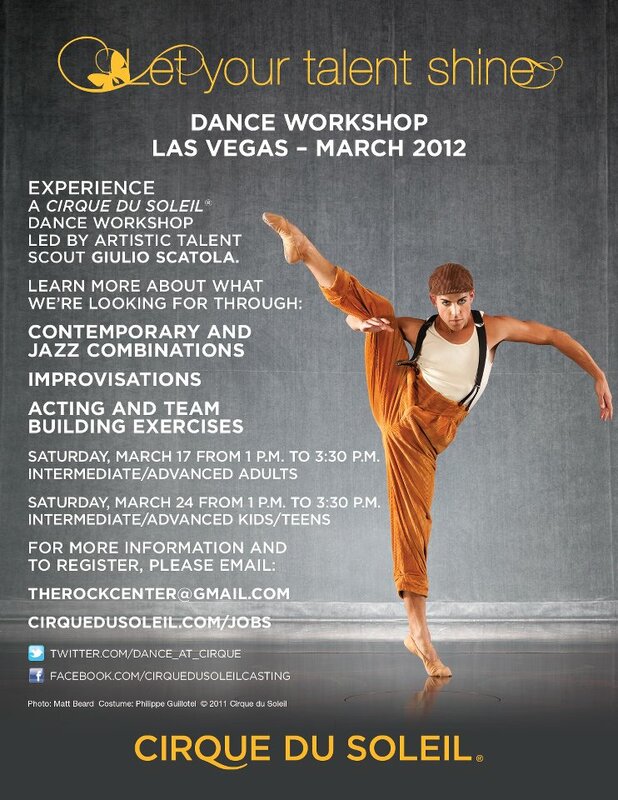 For more information about aerial training, check out the Hayden Productions Vegas website.